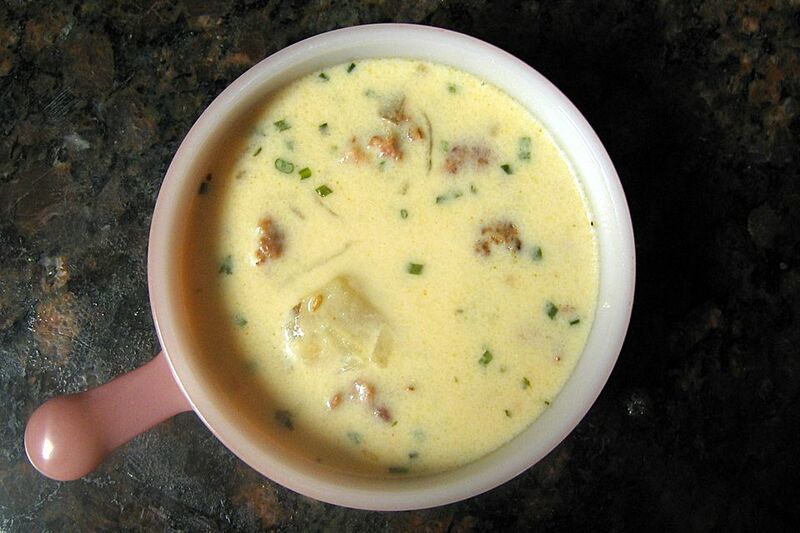 Cook this great-tasting potato soup in the slow cooker or on the stovetop. Russet potatoes work incredibly well in the dish, but other potatoes will work as well. Use heavy cream instead of evaporated milk or half-and-half for a richer soup. Wash and thinly slice potatoes, then coarsely chop the slices. Leave some of the potato peel on, if possible. Thinly slice the onion and then coarsely chop. In 3 1/2 to 6-quart slow cooker combine potato, onion, cream of potato soup, and chicken broth. Turn the slow cooker on HIGH. In a large skillet over medium heat, brown the sausage, breaking up into small pieces. Drain well on paper towels and then add to the slow cooker. Cover and cook on HIGH for 2 1/2 to 3 1/2 hours, or until vegetables are tender. Add the evaporated milk and parsley. Taste for seasonings and add seasoned salt and pepper to taste. Continue to cook for 15 to 20 minutes longer, or until heated through. Follow the preparations directions above, but put everything in a stockpot or Dutch oven and simmer over low heat for about 45 minutes to 1 hour, or until vegetables are tender. Add milk and seasonings and heat through before serving.